Blastrac Scarifiers are ideal for contractors when facing common slab problems. 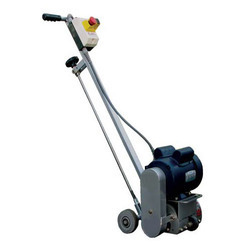 Blastrac makes the perfect scarifier to address your surface preparation needs. Green Dethatching machine fitted with Honda 3.5 HP engine. Engaging and disengaging by a clutch consisting of a set of pulleys, sprockets and chains. Dethatching blades totalling 12 nos. at 50 mm. width are of special steel fully tempered.